Halloween Costume on a Budget! I was having a hard time deciding what to be for Halloween this year. I've been so busy with my job hunt that I really found it hard to come up with something. On Friday night I went out with my sister and through our conversation I came up with the idea of being a Zombie! Not only could I make the costume out of a old dress, it was a simple and cheap idea that would not take long to make. My costume was made in 1/2 an hour Saturday afternoon ;) I had a dress which I had for years and worn it plenty of times, so I decided to cut it up! I also cut up a pair of tights and made arm bands with old pantyhose heehee. Done! Now all I need to do is wear scary makeup and tease my hair and there I have, a Zombie! To think of it, all my costumes were always low cost. I never spent more than $30.00 on a costume, IF even that! 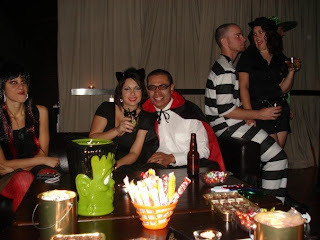 Below are some of my previous costumes. 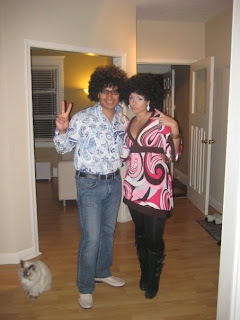 I love last years costume, 70's!!!! ahah I laugh at this picture every time I see it haha! Only had to purchase the wig for 12.99 and the rest came from my closet! Above was one of my cheapest Halloween costumes ahaha! 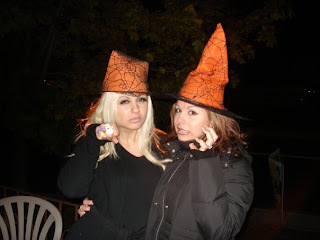 only bought the witch hat for $1.00 and the dollar store!! This week I'm going shopping for candy to give out to the neighborhood kids for Halloween. It's our first Halloween here at the new house so I hope I buy enough candy!! !